If you are buying a new 10.5-inches iPad Pro, you are probably going to need a highly competent keyboard case to go with it. The keyboard cases for the iPad Pro 10.5 features a slim design and a stand features which provides an incredible viewing and typing angle. Also, they’re wholly capable of shielding your tablet from bumps and even scratch. However, there are so many brands and models of keyboard cases that go along with the iPad Pro available on the market. Thus choosing the best keyboard case is not an easy task. Based on superior functionality and design, this best iEGrow F105 7 iPad Pro 10.5 Keyboard Case is worth serious consideration. The iEGrow F105 7 iPad Pro 10.5 Keyboard Case features 7-colors backlight options: red, white, yellow, green, cyan, blue, and purple. Additionally, it has three different levels of brightness control which makes the iPad Pro Keyboard case look fantastic when working. This means you can efficiently work under any environmental condition without worrying of mistyping. The iPad Pro keyboard case comes featuring a shaft bracket design which enables you to tilt the iPad Pro to up to 135 degrees. Thus providing you with comfortable viewing position and even change your iPad to a small MacBook in just a matter of seconds. The keys are highly responsive and allow you to type as smoothly as you would prefer. The keyboard case features a compact and sleek design enabling you to carry it without any hassle. The accurate cutout makes flawless access to all the switches, speakers, volume up/down, lightning connector, the camera as well as headphone jack. The iEGrow F105 7 iPad Pro 10.5 Keyboard Case features a solid construction, sturdy enough to withstand impact and keep scratches away from damaging your iPad. The built-in battery enables you to continuously use the keyboard case for up to 5 hours with backlit or up to 181 hours without the backlit. The intelligent switches automatically wake or puts the iPad to sleep when it’s opened and closed – this prevents unnecessary power consumption. The major drawback of the iEGrow F105 7 iPad Pro 10.5 Keyboard Case is that it is only compatible with the 2017 release 10.5-inches iPad Pro generation. The keyboard case won’t fit on any other iPad except for the iPad Pro 10.5. The case is very affordable. It is lightweight hence easy to carry around. It is flexible and quite easy to use. The keyboard case is only compatible with the 2017 release 10.5-inches iPad Pro generation. It doesn’t fit on any other iPad except iPad Pro 10.5. 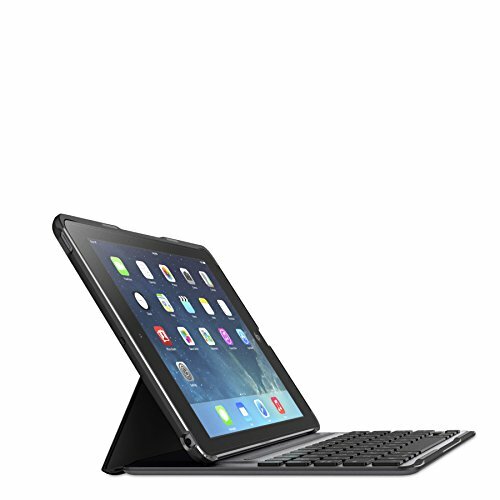 If you’re looking for an affordable yet a high-quality keyboard case for your iPad Pro 10.5, then the iEGrow F105 7 iPad Pro 10.5 Keyboard Case is an excellent option for you. The keyboard case is both sturdy and durable hence offering maximum protection to your iPad against any scratches, drops, and crashes. It is super-light therefore easy to carry and comes fitted with a rechargeable battery which allows you to use the keyboard case for an extended period.